A Memphis Wood Fire Grill is the backyard chef’s secret weapon. By combining four separate cooking techniques (grilling, wood-fire searing, low-n-slow smoking, and convection baking), these are quite possibly the most versatile and flavor-enhancing devices on the planet. 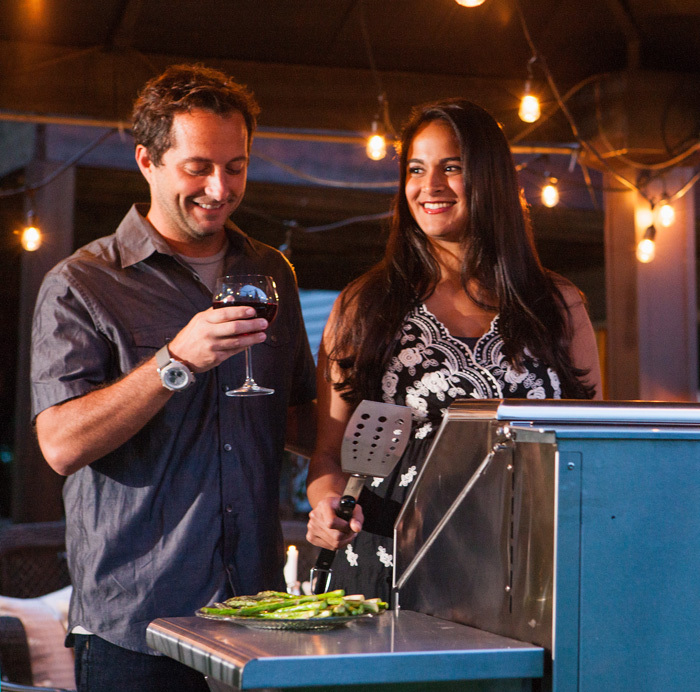 Memphis Wood Fire grills offer the latest in state-of-the-art technology and intelligent design. Our Memphis Mobile App (iOS) ensures you can monitor and adjust your grill no matter where you are—at work, on the lake, or downstairs watching the game. A little known fact: most pellet smokers cannot properly sear meat. We say what good is a grill if it can’t sear meat to get that delicious caramelized crust? Worry not, however, your Memphis Wood Fire Grill has mastered the flame game. Depending on your model of Memphis, your sear temperature will range from a crazy 500-700 degrees or to an off-the-charts hot if you utilize the direct flame mode. Smoking food used to take time, patience, and a sleeping bag next to the grill. With your Memphis, you can go to bed in the evening, and wake up with a perfectly cooked brisket or pork shoulder. You can even leave it unattended as you entertain your guests. The ideal range for smoking on the Memphis is 180 – 295 degrees. The great thing about smoking meat is that you can keep the lid down and let that slow indirect heat do the work for you, especially since you won’t need to lose heat when refueling. Your Memphis comes standard as a true convection oven, perfect for roasting meats, poultry, veggies, or baking magnificent pastries and breads. A rotisserie isn’t necessary, you can make amazing roast chickens without a fussy motor and skewers! The convection fans circulate the heat of the grill evenly, providing consistent temperatures so that all you have to do is set the temp and timer, just like on your kitchen stove. Memphis is all about effortless cooking, with that delicious hint of smoke that you can’t get anywhere else. Anything you can bake inside, we can bake outside; bread, pizza, cookies, pie – yes pie. (Ever had a pecan pie with just a hint of smoke? Your taste buds haven’t lived until you have.) Don’t be afraid to try cooking old recipes in a new way, it will bring out flavors you didn’t know existed!